So. Been pretty quiet since new year. Hate to ask this, but is there anybody still interested in continuing the project? I'm definitely still interested in the project. I have only been doing a minimum of modding since the beginning of 2016, finishing that one uncompleted shotn-cave I still had. I see where you're coming from. If there's no more than three or four willing to see it through, that's simply not enough for a project on this scale. I will always have a special love for this project and all of you guys and if development picks up again I'm sure I'll continue to contribute - with that said, my free time is coming more and more at a premium lately and with real-world stresses (job and applying for graduate school) becoming a larger factor, it's not giving me the same joy it used to (then again, it's always come in waves for me, so maybe that will change again someday). This problem is not only related to P:C, but to PT in general. It's the magic circle all over again. Release the content, right now as it is! Either it will bring more attention to the project and some new blood, or at least it won't be all locked up here, slowly starving with dust falling on it. I finished my exams today and I plan to be quite active in following weeks. Foremostly I want to get SHotN exteriors release-ready (I should yet again spam you with my maps and proposals in few days ) and grab three or four more interiors along the way too, but later on I'd actually like to try my hands at quest making. I'd like to take on of your Stirk's quest, Infragris, and make it my questing showcase. Can't tell yet when precisely I'll get to it, though. Lord Berandas wrote: This problem is not only related to P:C, but to PT in general. It's the magic circle all over again. Release the content, right now as it is! Once again I agree with this, but then, with stable releases both of Stirk and the upper Karth area being so close (and they are, I think?) maybe we should rather focus on polishing and releasing them, and then the rest of our contents as a beta? I don't really know. @berry: thank you, quest and dialogue are always a bit of a bottleneck. @Lord Berandas: I think we should if there is a genuine lack of interest, but as things are now I hope we can at least add quests and dialogue, making the island a finished and complete product. 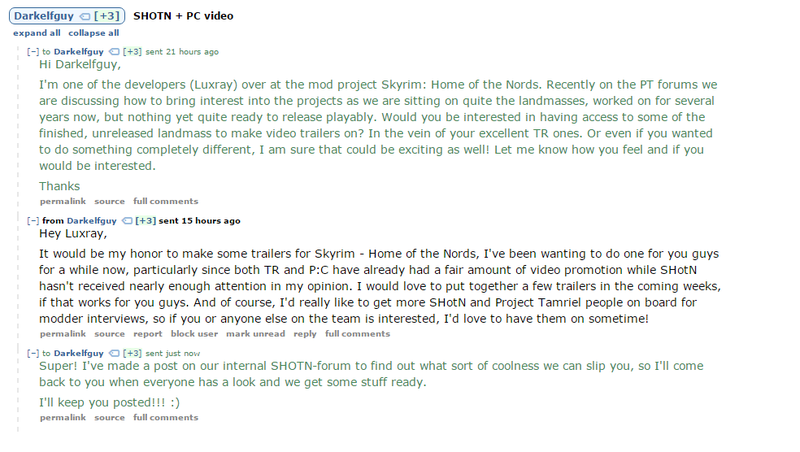 I'm glad to see that people are still interested in continuing work on Cyrodiil, even if they don't have the time right now. We don't have a deadline to worry about, after all. I'm still kicking about and working slowly on my interior claims. Things are quite quiet around here, but I think it's a reinforcing cycle of slow-progress not really drawing much activity from everyone. I would suggest thrashing out a release plan on the relevant forums and an achievable checklist of things that need to be completed for the releases to happen. As it is both projects have been working steadily for some time on things that, due to the workflow, won't be released for a while yet. Focus should turn, where possible, to NPC'ing and release polishing; but with the huge landmasses for both the Reach and the Gold Coast we are sitting on, we could polish for months and still not be finished. A decision needs to be agreed upon- as to the release parameters and what stage things should go out. Obviously NPC'ed and quested is the gold standard especially for Stirk- and the Karthwasten- releases given how long they've been worked on. But as to the rest of the landmass, I wouldn't mind a beta release just to romp around in like berry suggests, if people agree. I'm available for any NPC implementation, quest creation and scripting needed, but not quest planning or dialogue writing (that's not my strong point). I agree with berry and Lord Berandas. I see the best way of drumming up interest as sort of following the TR route and having a "Main" file (e.g. Stirk) and an unfinished "Preview" file (Gold Coast/Anvil). While the actual release of finished content like Stirk would be somewhat of a boon to activity, a preview file would be more so. Especially with so many interiors from Brina Cross having been completed/worked on. It would also help ensure that any newcomers should be able to more easily pick up where other modders left off should they leave. Outside of a finished Baan Malur (go team Redoran! Wooo! ), the Gold Coast and Anvil/Stirk are the regions I look forward to being completed the most. I really don't want this project to die and will follow it for years if need be. Jet133 wrote: I see the best way of drumming up interest as sort of following the TR route and having a "Main" file (e.g. Stirk) and an unfinished "Preview" file (Gold Coast/Anvil). While the actual release of finished content like Stirk would be somewhat of a boon to activity, a preview file would be more so. That's exactly what I had in mind, imo that seems to be working well at TR. I did a load of work in october-december, but right now I'm working two jobs and started uni again. It's a tad too much right now. I think I'll eventually pick up again in a month or so, I'm still slowly chiseling away on Markarth. Hmmm. Now that we're talking about the beta region, I was wondering: would anyone be interested in picking up the Anvil exterior claim? Praedator has done a great job with it, but he hasn't shown up for over a year. The city is pretty much key to continued development of the mainland, and we can't afford to keep it in stasis indefinitely. Maybe a progress post will help? Perhaps a map showing which cells of the Gold Coast exterior need to be finished? Or a comprehensive list of interiors, with those finished, unfinished, and currently in progress? Pair it with a post of what CAN be completed, such as an interior that has all the proper assets (tileset, what have you...) but has yet to be created. Might spur some activity. I know Brina Cross had a jolt of progress a while back, but as far as I know, no interiors in Anvil have even been started. Well, we could always release some content for Darkelfguy to be reviewed in his videos, he's quite an icon terms of MW and YT. Youtube vids are a nice idea, but they take a lot of time and effort. Most people (including me) barely have enough time to work on the mod as it is. I'd like to see detailed progress maps, but I don't have a good overview of interiors and exteriors - that's just not my terrain. Darkelfguy would probably jump at the chance to make a video of our unreleased lands, could be a cool idea to judge interest in what we're sitting on! Last edited by griff on Sun Feb 07, 2016 10:42 pm, edited 1 time in total. Yeah, I've been waiting for the dialogue of Stirk to be finished so that we can implement quests and call it "finished", it will definitely boost everyone's motivation. I could lend some help here if needed. I've never passed an exterior showcase anywhere, but I believe my skills would be sufficient to work on Anvil (I did do some work on the Thirr River Valley exterior over at Tamriel Rebuilt that involved placing and moving buildings). Alternately, I could help out with Stirk's dialogue once I'm finished with Karthwasten. I can only really handle writing for city at a time, unfortunately. As long as you don't burn yourself out - sure. You've got all the knowledge when it comes to logistics and city planning. We could also just pass Anvil back and forth between multiple people depending on what needs to be done (as we did with Karthwasten). It's awesome to see this thread revitalizing the project (not that it had ever died). I agree that a beta and a prompt to DEG would be an excellent direction to take. Doing so would help raise awareness of what has already been accomplished but what's left to do as well. It was extremely temporary, but I did get a few people volunteering to help with Lyithdonea whenever I alpha released. And I got some neat interiors out of the arrangement. And some of them may have come back to do more if I hadn't dropped off to work on ModTown. It actually seems that PT is not that abandoned as we thought, we're just bunch of silent guys. Last edited by Lord Berandas on Mon Feb 08, 2016 10:46 pm, edited 1 time in total. Scamp wrote: As long as you don't burn yourself out - sure. You've got all the knowledge when it comes to logistics and city planning. We could also just pass Anvil back and forth between multiple people depending on what needs to be done (as we did with Karthwasten). No worries. As long as I can mix dialogue writing and CS work, I should be able to keep myself from burning out. Taking on a new project might finally get me back on track with modding regularly. And yes, we can always pass it back and forth when needed. Not sure if this is the right place to post this, but since this has sort of turned into a revitalization topic, I figured here would be good. Under the Region Planning subsection in Mod Planning, I think it would be a good idea for whoever can to start at least one thread for general brainstorming in each County section. This would provide a place to put various ideas people had for those counties without them getting lost in the shuffle when they're discussed under more generalized topics. Would also provide more jumping off points for future planning sessions, hopefully making things go smoother. Jet133 wrote: Under the Region Planning subsection in Mod Planning, I think it would be a good idea for whoever can to start at least one thread for general brainstorming in each County section. This would provide a place to put various ideas people had for those counties without them getting lost in the shuffle when they're discussed under more generalized topics. Would also provide more jumping off points for future planning sessions, hopefully making things go smoother. This is a good point, actually. I'll get to it. Darkelfguy seemed pretty up for it, so I made a post in the internal shotn-forum further on the topic. As I've been foreshadowing for a while, I'm moving out tomorrow and I'll be pretty inactive in following weeks. I'll try to remain on an ongoing basis with the boards, but I can't say when I'll be able to get any actual modding work done.